"Who Are the Real “Orientalists”?" The protests that swept across the Tibetan region three years ago led to some interesting conclusions among China’s mainstream scholars and writers. 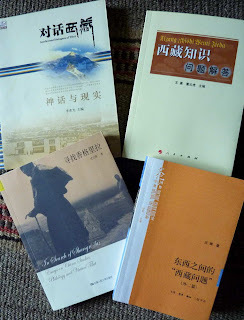 For example, Professors Wang Hui from Tsinghua University, who does not seem to be “an expert in Tibetan studies”, and Shen Weirong, the “Tibetan expert” from Renmin University, both published articles and books vehemently criticising the West’s “Shangri-La complex” and “Shangri-La Myth” as being nothing but mysterious “Orientalism”. This so-called “Shangri-La” place originates from the novel “Lost Horizon” that was written by James Hilton over 70 years ago. It became so popular that it was later turned into a Hollywood film and adopted into the English dictionary as English vocabulary, meaning “the Garden of the Peaches of Immortality”. “Shangri-La” became a symbol for paradise, whose opposite would be “hell”, or according to Chinese culture, “the Palace of Yama Raja” (King of Hell). It is really peculiar that this “Shangri-La”, which is being ridiculed by Chinese scholars as “Orientalism”, is in actual fact becoming reality right in front of their eyes. In 2001, Zhongdian, the capital city of Dechen Tibetan Autonomous Prefecture in Yunnan, officially changed its name to Shangri-La. Of course, this was a government move and it connotes authoritarian power. It is said that it was done to promote the development of tourism and attract tourists from home and abroad. But this corner of the eastern Tibetan Kham region, whose name is actually Gyalthang, has experienced numerous name changes along with the overall changing state of affairs. Half a century ago, it was named Zhongdian, and now it was simply changed into Shangri-La. Indeed, these nice names are nothing but political ventures to cater to the fantasies and imaginations of the “other”. Professor Wang Hui is particularly disappointed about this and thinks that the West’s mystification of Tibet has already spread to and infected China. But does this mean that China usually demonises Tibet and has now started to cater to the West? Or does it mean that the West has finally managed to change China’s demonising stance towards Tibet? I have previously written that Tibet is by no means the “Pure Land” that people imagine it to be. Tibet is just like any other place in the world, it is a place where people live. The only difference is that it has strong beliefs and is thus a place shining in maroon-red (the colour of the monks’ robes). In history, there have existed two stereotypical attitudes towards Tibet: demonisation and sanctification. The result, however, has always been the same: Tibet and its people have been distorted. Perhaps we should remind these Chinese scholars and ask them whether they approve of the CCP’s final conclusion with regards to the “Old Tibet”, describing it as “the most reactionary, the darkest, the most brutal, and the most barbaric” place. Also, we should ask them whether they admit that it is actually China that entertains “Orientalism” with regards to Tibet and that it is the kind of “Orientalism” that demonises Tibet. Especially since they believed that in 2008, it was Western societies that dominated and influenced Tibet, why don’t they just stop and think for a moment; why would the “emancipated serfs” who have been living a “liberated” life for so many years rise up to protest and “liberate” themselves? How is it possible that on the vast Tibetan land, most of the numerous protesters who took to the streets or galloped out onto the grasslands, were in fact born after Tibetans had already been “liberated” by the CCP? They just pat each other on the backs, praising that their criticism of the West reveals a certain kind of “rationality and intuitive knowledge”; but from the start to the very end, they never voiced a single critical sentence about their own country, their own society and system, which has long grown accustomed to demonising Tibet. These people are scholars, not politicians; but of course, they are scholars of the state, so it is little surprising that they choose to stay blind. Also, since they like the word “Orientalism” so much, they should remember the two quotes on the first page of Edward Said’s monumental book “Orientalism”. One comes from Karl Marx: “They cannot represent themselves, they must be represented”; and the second one comes from a British writer: “The East is a career”.